Can the Olympics facilities withstand an earthquake? A recent estimate by a government panel in late 2013 reported that a magnitude-7 earthquake directly under Tokyo could destroy as many as 610,000 buildings in Tokyo and the neighbouring three prefectures. 70% of the affected buildings could be destroyed by fires that quickly spread through densely packed neighbourhoods. Many of the Olympic events are centred around the islands in Tokyo Bay. While they may be spared from the risk of fire due to the open space, these man-made islands can suffer damage from liquefaction and are even at risk of being submerged by a tsunami. A working group from the Cabinet Office’s Disaster Management Group are requesting that urgent measures be taken to reduce the risk of any damage and to make sure that the Olympics can be held without disruption. The bayside area will host a number of Olympic events and also accommodate up to 17,000 people in the Athlete’s Village. 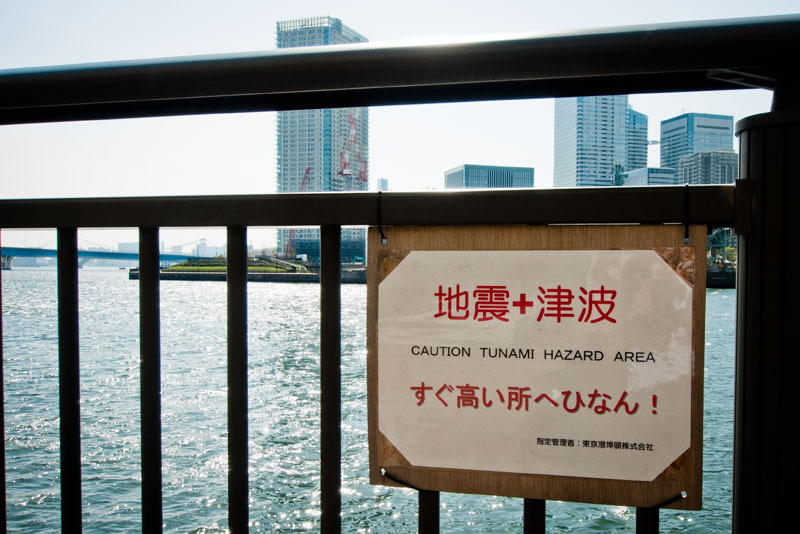 The working group have predicted that a magnitude-7 earthquake could cause a tsunami less than 1 meter in height. While this is a relatively low height, it could inundate some waterfront areas. A representative from the Tokyo Metropolitan Government said that the site for the Athlete’s Village on Harumi is in urgent need of a seawall or embankment of around 2.5 meters to protect it from potential tide surges. Of particular concern is the risk of liquefaction. The bayside Olympic facilities will be built on sandy reclaimed land, which is more susceptible to liquefaction in an earthquake. To protect against damage from liquefaction, new buildings in these areas need be built at 1.25 times the minimum earthquake-resistant strength as required under the Building Standards Act and have foundations that are deep enough to reach solid ground. Even if the facilities themselves are able to withstand an earthquake and liquefaction, the surrounding area may not be so lucky. Gas and water pipelines could fracture, bridges linking the islands could fail and they could effectively be cut-off from Tokyo. Source: Sankei Biz, December 20, 2013.